The perfect chimney repair company offers prompt and professional service at an affordable price. It has experienced technicians and standard or above-standard industry tools. A trustworthy service provider will also have the legal qualifications to work in the area and will hold the right liability insurance for any potential mistakes their employees might make while on your property. Unfortunately, when it comes to having your yearly chimney inspection, many homeowners head straight to the Google instead of researching their options. Here’s what you need to know before you open your search engine. While Georgia isn’t known for its snow-laden winters, this season looks to be colder than average. Initial forecasts are calling for temperatures in the 20s to arrive by the end of December. Even before then, however, families gathering for the holidays might fill their homes with the inviting warmth of the fireplace. The National Fire Protection Association recommends having your chimney inspected at least once a year. Typically, this happens a month or so before your first use of the season. Thrifty homeowners might attempt to save money by scheduling a chimney inspection in the spring, but you risk missing damage caused by raging summer storms. The amount of money you save with off-season service isn’t worth the risk. Not only do technicians check for stray mouse or bird nests, but also for signs of deterioration or venting problems that draw carbon monoxide back into your home. The chimney inspector will also inform you of whether you need to clean your chimney. Doing so prevents fires. It also makes sure your fireplace gives off a woody, earthy odor and not the stink of tar or charred wood. You might want to schedule an inspection a few weeks early if you’re afraid there is any damage to your chimney. You’ll need time for a chimney repair service to follow-up. ● Blockage remediation: Anything from tree limbs to crumbling masonry can block the exit of your chimney. This presents an immediate risk to everyone in your home and is the number one reason to have an inspection in the fall. Chimney repair services have different tools for different types of blockages. Technicians will also know the best methods for clearing your chimney without introducing more damage. ● Creosote removal: As wood burns, thick particles called creosote drift up through the chimney. The sticky residue adheres to the smoke chamber, damper, and flue. Once this buildup is ¼-inch thick, it presents a real fire hazard. A thick layer of creosote will also prevent proper ventilation and places your family at risk for carbon monoxide poisoning. ● Flue replacement: When constructing a chimney, a flue or inner lining made of clay, brick, or metal protects your home from catching on fire. Some flue materials are more prone to cracking or pulling away from the chimney while expanding and contracting along with temperature changes. Steel flues are the most resistant. ● Crown and cap replacement: Your chimney crown covers the top of your chimney, preventing water from pouring down into your home. Likewise, the cap prevents water from entering your flue. If moisture gets inside, deterioration can set in quickly. Debris, harsh winds, beating rain, and changing temperatures can damage both the crown and cap. While homeowners often replace a damaged cap or crown, in some instances, it is possible to seal them sufficiently to keep water out. ● Mortar replacement: The brickwork on your chimney should last a century or longer, but it requires regular maintenance. Specifically, you want to replace mortar whenever it’s needed. If you wait too long for a touchup, expensive problems may be on the horizon. One of the easiest ways to find a qualified chimney repair company is by talking to professionals in related fields. The company you used for roofing or masonry work is a valuable source of referrals. Better yet, the business you already know to be reliable might provide chimney inspections and repairs. You can also check out reviews online on sites like Yelp, Google, and Facebook. If you’re new to the area, pay attention to the contractors who’ve been in business for a long time. Look for community partners with good reputations who operate legally. It’s tempting to save money by hiring an amateur, but a handyman might not have the tools or training required to keep your chimney safe. You’ll also want to cover your liabilities. A professional contractor of any kind should carry insurance. Whenever someone is on your roof, there’s the possibility of an accident. Make sure you aren’t liable for any injuries or damages by working with a bona fide chimney repair company. 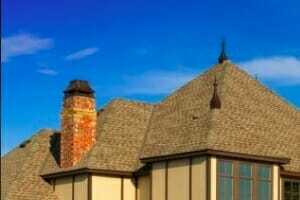 The leading chimney repair company in the Cummings area is also the leader in roofing. Contact the team you can trust at Hopewell Roofing & Restoration today.